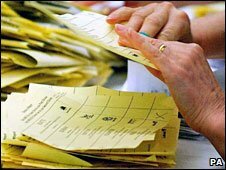 Changing Britain’s “first past the post” voting system. The first past the post system is often called unfair. Is it because it makes it very difficult for medium-sized or small parties to get any of their candidates elected as MPs if the support for these parties is spread evenly throughout the UK? Read these articles on how Gordon Brown is planning to change this system. Write a commentary on your blog explaining the changes and why you think they may /may not happen.